Share the post "Fast Track, Young Alumni on the Move: Marc Valitutto (CC’02)"
Marc Valitutto CC’02, Animal Science. I am a zoo/wildlife veterinarian, my profession since 2007 after I graduated from veterinary school in 2006 from the University of Pennsylvania. In July 2016, I took a position with the Smithsonian doing global wildlife field work. Right now I am in Myanmar for the Global Health Program of the Smithsonian Conservation Biology Institute/National Zoo. A: Cook College, in particular, did an amazing job of encouraging all students to join various schoolwide student body programs, including Leadership Council, Society for Animal Science, the Pre-vet Club, and more. These gave me the ability to enact change with tangible results. The students had a direct opportunity to offer ideas and concerns and were encouraged to navigate around obstacles to achieve results. I credit my extracurricular experiences for allowing me to mature socially and to significantly develop my communication skills. A: Ag Field Day was always the highlight of the year. “Swine-stein” was a pig I trained one year for the animal science practicum class—a glorious second-place pig. I also spent a great deal of time studying at Passion Puddle, rolling around in Canada goose poop. My career as a wildlife veterinarian studying zoonotic disease would have me considering otherwise, but I would probably do it again. A: The Smithsonian’s Global Health Program continues to expand its “One Health” research nationally and internationally. As stated by the CDC: One Health recognizes that the health of people is connected to the health of animals and the environment. The goal of One Health is to encourage the collaborative efforts of multiple disciplines—working locally, nationally, and globally—to achieve the best health for people, animals, and our environment. As a wildlife veterinarian, the work I do with the Global Health Program allows me to focus on animal health along with the greater implications on human health, environmental health, and conservation. 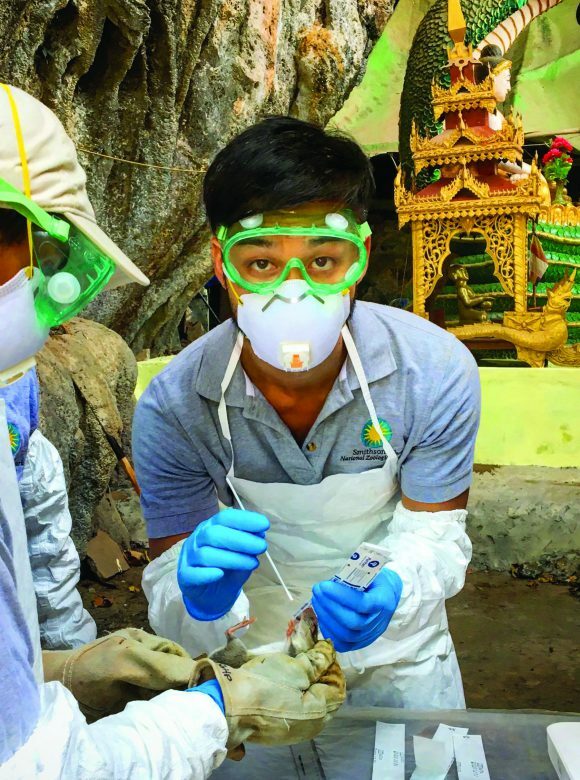 My focus has largely been on projects in Asia, including zoonotic disease investigation of wildlife, humans, and livestock in Myanmar; giant panda health research in China; and pangolin health and conservation in Africa and Southeast Asia. A: Coming from the school focused on environmental and biological sciences, I am proud of the experiences I gained as a student both in and out of the classroom.